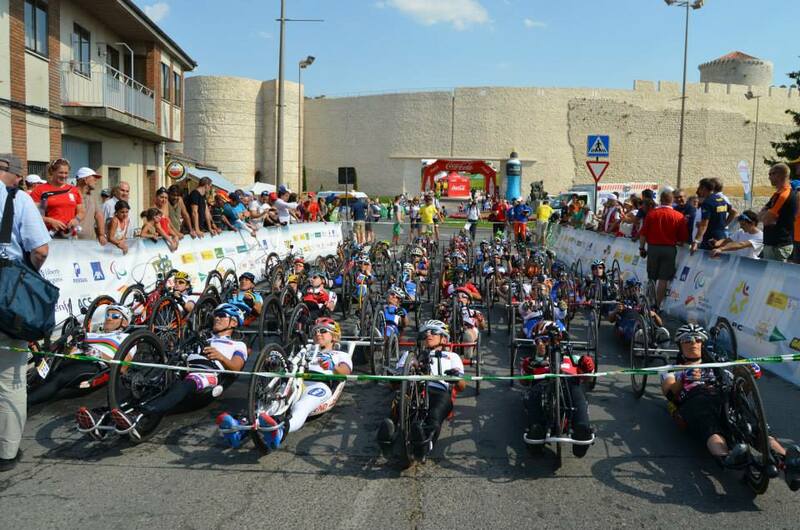 Despite not knowing a word of Italian, I embarked on a solo trip encumbered as usual by my hand bike, a wheel bag, a suitcase, a rucksack and a wheelchair, this time to Castiglione della Pescaia in Italy for the first World Cup on the para-cycling calendar. I booked a holiday apartment in a camp site thinking I could ride to the race venue and Facebook-ed a plea for help in how to get from Rome to Castiglione. My journey proper started with a coach transfer from the Airport to the main Railway Station in Rome, where fortunately various lovely random people offered their help to get my ticket and shift my luggage, I even acquired a rather handy Italian phrasebook from an American couple. Unfortunately, I was unaware that assistance needed to be booked 12 hours in advance and this caused much gesticulating and harsh sounding phone calls at the Sale Blu office before help could be arranged. After a couple of hours waiting, I was loaded onto the slow train to Grossetto via a kind of golf cart lift, as the trains are two stories high. I eventually arrived late at night to my accommodation via a further 25km taxi ride. Whilst training on the road the next day, Andrey Ri, a Russian hand cyclist who had replied to my plea for help, stopped and spoke to me. We arranged to meet for training and he also took me to Registration and the official Team Hotel where the British cycling guys were, so that I could give them my uniform for approval and my race licence. I was also blessed with meeting a lovely Austrian couple with their toddler who drove me and my bike into the race venue each day. On race day, I parked my kit next to the official GB tent and went off to warm-up, only to find the road closed. Mildly panicked, I was kindly offered a British Cycling turbo to use, then it was lining up and the bike check and straight onto the start ramp. Whilst the TT was on a flat course, the road surface was not ideal and the turns were tight and technical at the start, turnaround and finish. I’d decided to pace myself over the 15km, but was disappointed with both my average speed and Watts, although I came 5th. The RR the next day was around the Town and rumours had spread about crashes and how dangerous it was, being both fast and technical. My race started badly, with a crowded, chaotic start in a narrow side street. I knew as soon as I started it would be a solo effort with nobody to draft. I had to set my GPS during the race and then my water bottle split and dragged along the ground. I stopped twice for help from Marshals and eventually pulled the drinking tube free and ditched it. I had a gel thinking at least that would give me some much needed fluid over the 57km race. I then fought hard to regain my position and finished 5th. As it turned out, I was lucky, as Karen Darke (H3) crashed out of her race, breaking her nose. One of my competitors, Silke Pan crashed into a wall, with the Korean H4 girl snapping her hand crank clean off her Carbon.ch bike! She still finished the race in third place! Winter training in South Africa! Most hand cyclists I know disappear off to Lanzorote for a few weeks of winter training, but I like to be different! I met Hilary Lewis, organiser of the Toer de Kaap (TDK), at my first UCI World Cup in Segovia last year and she managed to talk me into giving the hand cycle event an attempt. I didn’t know at the time I booked that she has only completed the entire tour once and Hilary thrives on tough challenges! It seemed sensible to stay on in South Africa and visit relatives in Cape Town afterwards and then of course, it was just the right timing to do the beautiful Argus Cycle Tour. I love how they describe it as a tour, when in fact it is a cruelling 109km with 1340m elevation. It turned out that the TDK was extremely good training for the Argus, despite suffering in the 39 degree heat and having to be doused with cold water virtually every half hour by our lovely support drivers. I did 386.7km, with 4,129m elevation in 29:37:00 over the six days of the tour, and was 170.3km short of completing. Perhaps living and training in Lincolnshire was my downfall! Actually, I’m very proud of my achievement, as I massively increased both my weekly miles and hours and am not fazed by climbing any more! So, a few ‘easy’ weeks followed, staying at the Stellenbosch Academy of Sport http://www.sastraining.co.za and training with beautiful views of vineyards and mountains. Then it was onto Cape Town to stay with my Aunt and visit my cousin and his baby daughter and relatives. My cousin Craig is attempting the Robben Island swim in April and he was keen to show this ex-triathlete the beautiful Bays of Cape Town. Armed with my trusty Huub wetsuit, I braved the 14 degree water, feeling decidedly wimpy compared to the cozzy only clad swimmers. It did cross my mind that I would definitely look more seal like in my rubber suit and hence potentially appetising to any passing Great Whites…I kept my face in the water far more than I usually do! I was lucky that Craig had a big new family car to take me and my bike to the bottom of the two last climbs on the Argus, so I was able to practice Suikerbosse and Chapman’s Peak before race day. Each single climb was not difficult, but they would come when I’d already completed over 80km, so it was nice to feel mentally prepared. I was also delighted to be ‘kidnapped’ by Delia, who I had met in George before the TDK, and her husband Johann, both hand cyclists,and taken to Melkbosstrand, so that I could train somewhere flatter than the side of Table Mountain. They were incredibly generous and wonderful people, to the extent that Johann was up at 4am race morning to drive me to the start, having prepped my bike the night before. 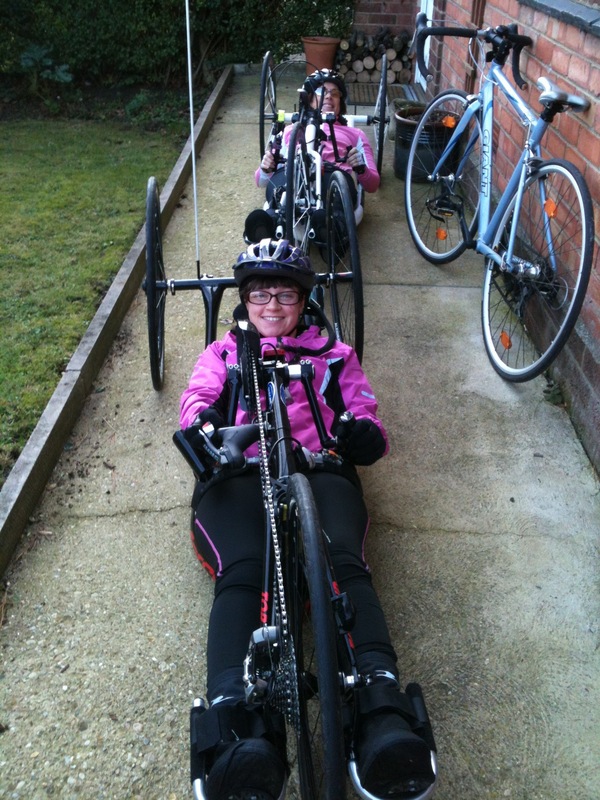 There were 28 recumbents in our start group, with just over 20 being hand cyclists, although only two women. Unfortunately, we had a South Easterly wind for the first 50km of the race but the scenery was a good distraction. 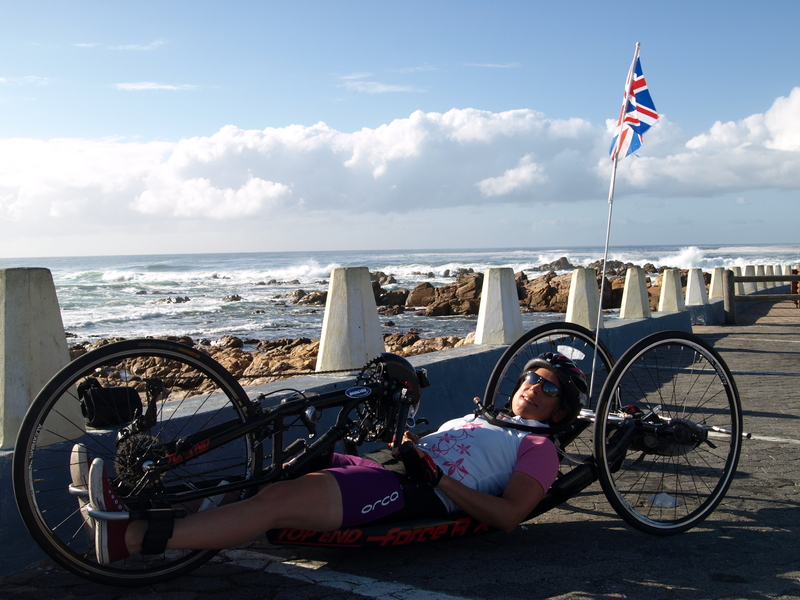 I rode with Brunhild, a South African hand cyclist, sharing the load and motivating each other on, until about 30km to go when I seemed to get a second wind and picked up the pace. 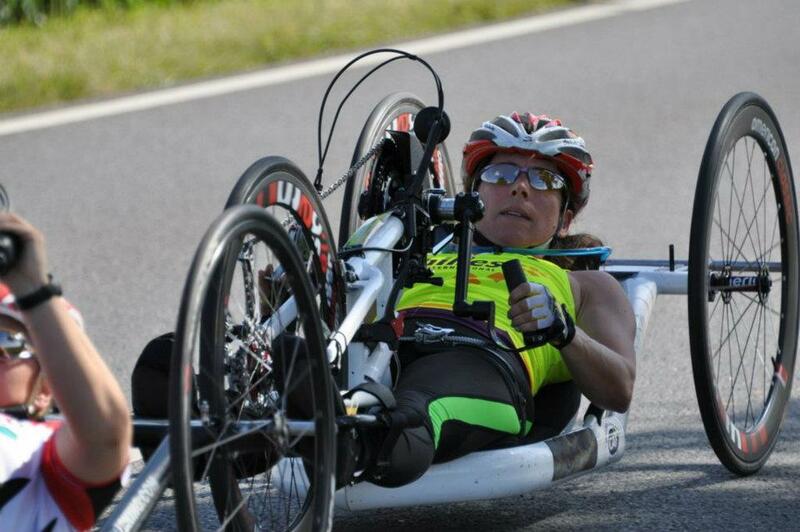 I completed the Argus in 07:09:04, the first official female handcyclist to finish. What a fantastic way to end my wonderful month in South Africa. Now it’s all about training to race! 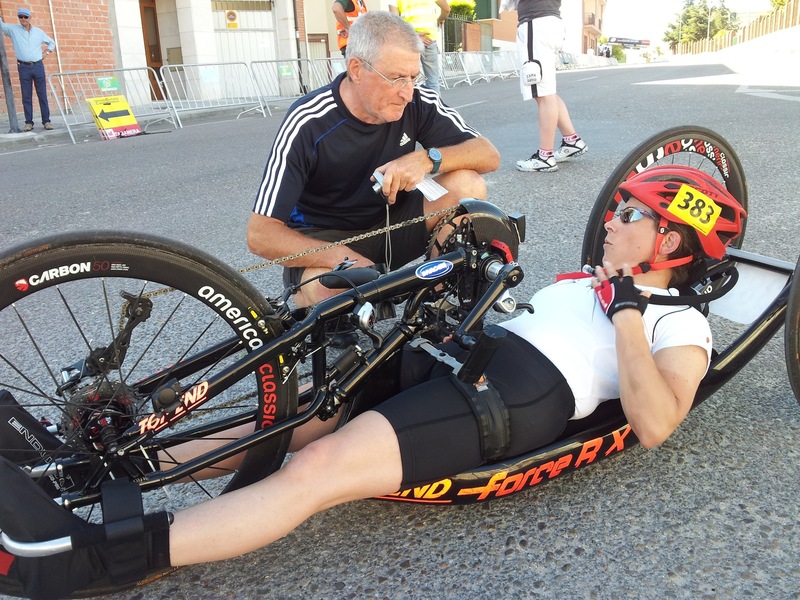 Adventures in Handcycling – the story of 2013! Last week I was honoured to be a special guest at the Alford Wheelers cycle club annual awards dinner- here’s my speech! Sophie and I have been competing at Disability Swimming competitions as part of the East Midlands Squad for several years now and I have been encouraging her to give ParaTriathlon a go. She attended a British Triathlon Federation Talent Day in March but was keen to try out a hand bike for the first time, since none were available in Loughborough. Luckily, Sophie is petite like me and she slotted neatly into my race bike with no problems. I decided it would be cruel to put her in my old second hand 20.4kg Force R, so the Force RX at 12kg was the only option. With Sophie’s mum off on my son’s road bike for a jaunt round Lincolnshire’s lanes, we set off on our own adventure. This was Sophie’s first EVER bike ride, as her severe CP has meant she has not even been able to ride a trike. 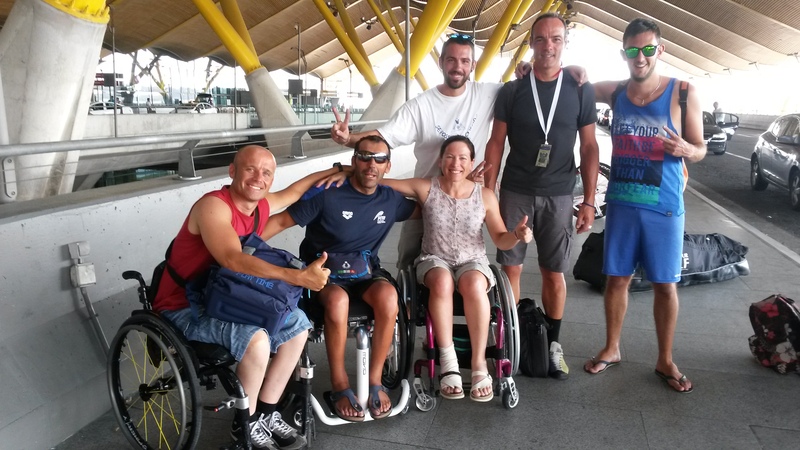 It was with trepidation that I travelled to Spain to compete in another UCI Para-cycling World Cup this time against the worlds top female hand cyclists, all of whom had competed in London 2012 Paralympics. To be able to compete Internationally in Para-cycling required me classified again and my appointment had been allocated a few days prior to the competition which meant I had time to do a few training rides in the sunshine. Unfortunately, I didn’t take into account the topography of the area where the official Hotel was situated and my ‘easy’ ride turned into a bit of a nightmare, especially when my gears failed on the long climb back. A UCI official Jose Aurelio, kindly stopped after seeing me stuck on the side of the road. I was fortunate that the South African Team Mechanic was able to fix the problem. As I was classed as an ‘Independent’ and not part of the official funded GB team, I relied on the organised transport to get me to the race site, about an hour away. The Time Trial was a flat and fast out and back course with one steep bridge. I was seeded first as the slowest competitor and we set off down the start ramp in two minute intervals. It was hard to gauge my effort with nobody to chase down in front, but Rachel Morris overtook me after the halfway point, with the others swiftly following. My lack of an opportunity to navigate the course beforehand meant I was unprepared for where the turnaround was and how to tackle it. Fortunately, I have met Mark Rohan, an Irish Paralympian, at other races, and his friends Anne and David Hadfield where only too happy to drive me round the course for the next day’s Road race course so I was more prepared for the tight turns, speed bumps and steep cobbled section repeated over three laps totalling 36km. The Road Race was a bunched start and I had hoped to be near to Rachel to at least draft for the first of three laps, but I was placed way back in the pack. I had not realised the mixed category and gender race meant I could draft anyone, as usually we can only draft within our own categories, indicated by helmet colours, and did the entire race as a solo time trial. I finished fifth in both the TT and RR, and was pleasantly surprised to be ranked joint first in the UCI world rankings afterwards!